BEEN THERE: I saw Three Rivers Stadium from a distance in 1986, and I saw it up close in August 2000, just five months before it was demolished. It was probably inevitable that the Pirates would eventually abandon funky old Forbes Field, but the tragedy was compounded in 1970 when they went along with prevailing fashion by building a boring generic "doughnut" stadium as part of a deal with the Steelers football team. The first baseball game was on July 16, just a few weeks after its cloned sibling opened in Cincinnati, 300 miles down the Ohio River. There were a few distinguishing traits worth mentioning, however. The bullpens were located in the right and left field corners, similar to San Diego Stadium, except that Three Rivers Stadium used the the "paired swivelable circular section lower deck" (PSCSLD) configuration. Making room for the bullpens in the corners necessitated two modifications: the extremities of the movable portions of the lower decks were truncated, and the left and right wings of the lower decks were oriented toward each other in a wider angle than at Riverfront Stadium or the other PSCSLD "clones." The dugouts were unusually close to each other, connected by a covered ground-level seating area like in the original seating configuration of Dodger Stadium. Another way in which Three Rivers Stadium stood out was its slightly elliptical shape, which was so subtle that I used to think it was circular. Among the other stadiums of its genre, only Busch Stadium II (St. Louis); Olympic Stadium (Montreal) was obviously oval in shape. Another difference from Riverfront Stadium was that there were two mezzanine levels, rather than one. In certain sections such as beyond right-center field, however, the two mezzanine levels were combined into one, with regular seats. The "Allegheny Club" on the first base side and other several glass-enclosed suites provided air-conditioned comfort for high-paying club members. As a consequence, the upper deck was 70+ feet above the ground, true "nosebleed" elevation. 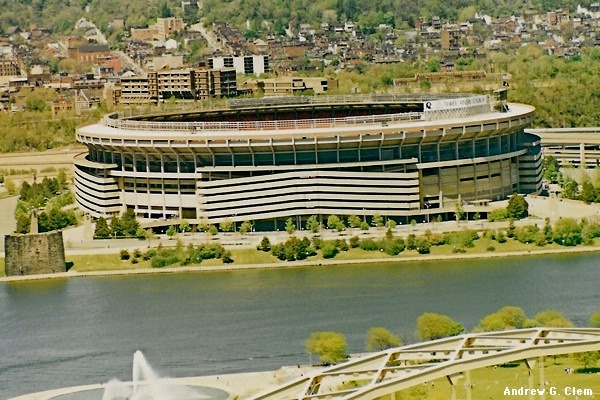 The one big positive aspect of Three Rivers Stadium was its location at the scenic confluence of the Alleghany and Monongahela Rivers, just across from the "tip" of downtown Pittsburgh. As with the Cincinnati Reds, the new stadium galvanized the Pirates, who were constant championship contenders during the 1970s, when they won six divisional titles and two World Series (1971 and 1979). Roberto Clemente was the Most Valuable Player on the former occasion, and in the following year he hit his 3,000th career hit on the last day of the 1972 season. Three months later, on New Year's Eve, this true hero died in a tragic plane crash en route to help earthquake victims in Nicaragua. The other Pirate Hall-of-Famer from that era, Willie Stargell, is the only batter to have hit more than one home run into the very high upper deck at Three Rivers Stadium; he did that four times. The triumphant 1979 season is remembered for the "We Are Family" anthem that defined the spirited emergence of a New (post-industrial) Pittsburgh. Energized by rookie slugger Barry Bonds (! ), the Pirates won three divisional titles again in the early 1990s, but failed to make it back to the World Series. There was only one notable modification to the playing field during this stadium's history: in 1975 the outfield fence was brought in by ten feet to make room for additional seats in center field; the distances were reduced by five feet in each corner. In 1983, a new Diamond Vision scoreboard was installed in the upper deck of center field, occupying the top twelve rows. Large advertising billboards were put on the front edge of the roof right above that, the exterior side of which had time and temperature displays. (See Photo #2 below.) During the 1980s, the capacity grew by about 9,000 from the original figure of about 50,000, part of which was accomplished by adding more rows of seats in back of the 300 (orange in diagram above) and 400 (red in diagram above) mezzanine levels, from near the left foul pole to right-center field. In the latter years, four rows of seats were added between the dugouts, covering the warning track behind home plate. For baseball games, however, that was surplus capacity. Like other teams saddled with mostly-empty dual-use stadiums, in 1993 the Pirates covered most of the outfield upper-deck seating sections (and the upper parts of the sections near the foul poles) with a decorative tarp. Consequently, for the last few years of this famous stadium's history, the seating capacity for baseball games declined from about 59,000 to about 48,000. At about the same time the Pirates built a statue outside Three Rivers Stadium to commemorate their beloved hero and martyr, Roberto Clemente. Three Rivers Stadium was not as well suited for football, ironically. Because of the small size of the movable portion of the lower deck and the absence of any retractable seating sections (virtually unique among dual-use stadiums), there were big gaps at the corners of the football field, putting fans far from the action. (At Riverfront Stadium, in contrast, retractable seating sections filled those gaps in the corners.) Small temporary bleachers were sometimes placed in the corners on the "infield" side for football games, but otherwise the capacity for baseball and football games was virtually the same. A few months after Three Rivers Stadium was demolished via explosives (in February 2001), the Steelers moved into brand-new Heinz Field next door.